« HOT – Children’s Robitussin as low as $0.99! Not all toothbrushes are the same. This is something we have been told since all of us were in grade school. Every brand promises their brush will get your teeth cleaner and whiter that the others. They say their brushes can remove tartar and plaque more effectively than all the rest. But as most of us have found out, regular toothbrushes are pretty much all the same. According to the manufacturers instruction booklet that is included with each unit, they offer a lifetime of free brushes every 3 months and also a lifetime warranty for nominal shipping and handling fee. I checked how much this is and it amounted to $7.99. So your maintenance on this unit is fully covered. If this seems too much every 3 months, you can also go to their website to purchase additional brush heads or other attachments when you wish. How they get this cleaning system to work so well is because of the 45,000 brush strokes per minute that it generates. Being the fastest toothbrush in the world helps it to disintegrate plaque on contact, leaving your mouth looking and feeling as clean as can be. There is no need to “brush” your teeth in the typical way we are all used to. After you turn it on, you just move it over the surface of each tooth. The sonic pulsing does all the work for you. No need to scrub, just apply a little pressure as you move from tooth to tooth. This cleaning system has a price of $99.95. If this is something you would like to try, they are now offering a half price coupon on all sonic care products. 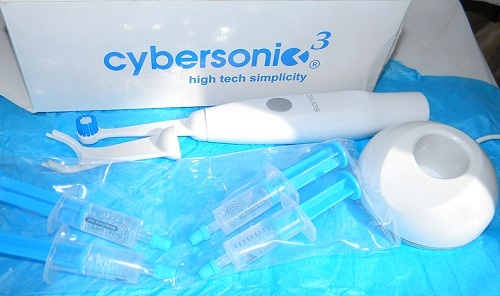 Just use the code HALFSYSTEM at sonictoothbrush.com. Make sure you come back on 10/15 as we will be having a giveaway where you could win one of your own!